Skeleton Coffin Candy Bars are delightfully spooky Halloween candy bars. These simple bars have just a few ingredients, but their looks are killer! 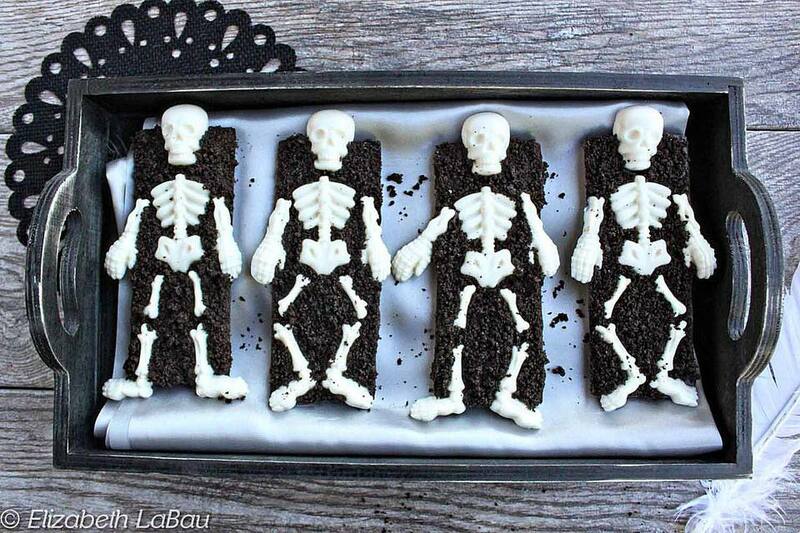 Chocolate bars are topped with an edible white chocolate skeleton and lots of cookie crumb "dirt" to make these cute and creepy treats. You will need some specialty candy molds to make these bars. I've included links to where you can buy them online, but during the Halloween season, many craft stores (like Michael's and JoAnn's) will carry similar products. Make sure your skeleton candy bar mold is clean and dry. Place the white candy coating in a medium microwave-safe bowl and melt in 30-second increments, stirring after every 30 seconds to prevent overheating. Continue to heat and stir until melted and smooth. Spoon the melted coating into the skeleton mold—you may find it easier to transfer it to a paper cone, piping bag, or plastic bag with the tip snipped off, since some of the bone cavities are small and narrow. Gently tap the mold against the countertop to remove any air bubbles. Run a metal spatula or knife along the top to remove any excess coating and make the edges of the molds clean. Refrigerate the mold until the white chocolate sets, about 15 minutes. Turn it upside-down and gently flex the mold so that the chocolate bones pop out. While you wait for the white chocolate skeletons, place the chocolate cookies in a food processor and process them until they're fine crumbs. Make sure your candy bar mold is clean and dry. Melt the chocolate candy coating the same way you melted the white coating. Spoon the chocolate into the mold and tap it gently to even out the chocolate and get rid of any air bubbles. Gently place the white chocolate skeleton pieces on top of the chocolate bars. Depending on the size of your molds, you may not use every piece of the skeleton—I omitted a few arm pieces to make my skeletons fit. Sprinkle cookie dirt all over the top of the bars. Refrigerate the tray to set the chocolate, for about 20 minutes. Once set, gently flex the mold to remove the bars and pop them out. Use a dry brush to brush stray dirt off the tops of the skeletons. Repeat the process until all of your candy bars are formed. These bars can be stored in an airtight container at room temperature for several weeks. Click Here to See All Halloween Candy Recipes! Click Here to See All Candy Bar Recipes!